Tyne Theatre & Opera House are excited to welcome Ant Middleton to their stage on Wednesday 14th March 2018. The adventurer, survival expert, TV presenter and ex-elite forces soldier will be touring theatres across the UK, sharing his experiences and exploits as a modern day explorer and expedition leader. Ant’s appetite for adventure and extremes has no limit and has led him to take on some amazing challenges both in the military and in his TV roles – SAS (Who Dares Wins), Mutiny and Escape (Channel 4). In this adventure filled one-man show, Ant recounts his extraordinary life in the military – having achieved the elite forces holy trinity serving in the paras, marines and SBS – with tales that will defy belief for their sheer bravery and danger. The tour also includes further tales and behind the scenes moments, revelations and gossip from his TV shows; and will give us an exclusive insight into his life and exciting future TV projects! 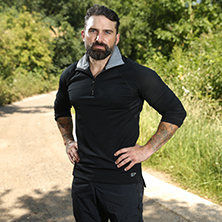 Ant Middleton’s forthcoming documentary series – SAS (Who Dares Wins) Series 3 and Escape will air in autumn 2017 and spring 2018. Recommended Over 16 (Under 16’s at parents/guardians discretion & must be accompanied by an adult).